Much of the average city’s infrastructure, including its transportation and information systems, is outdated, designed for “9–5” office workers or those in manufacturing and service industries. It is not suited to the needs of 21st-century higher education. College students’ schedules do not adhere to a typical workday. Students require breakout spaces and other gathering places that allow them to be “alone together.” And they increasingly work from such spaces, thanks to powerful, portable computers and diffuse storage options that allow them to take their work anywhere. Gone are the days of the computer lab. The infrastructure required by today’s educational landscape is far more fluid. The workplace is following the same trend, emphasizing collaboration, mobility, adaptability, and communication across different scales and at different distances. Universities increasingly prize real-world experience over purely academic work, and offering spaces that imitate the types of workplace environments students will encounter is part of a school’s mission. How do we create a desirable common area? And how can we encourage student ownership of these spaces while maintaining control over the security, activities, and branding of the facilities? These questions are complicated by the fact that while student needs have changed throughout the past 20 years, a city’s building stock remains much the same. This reality requires innovative approaches to the creation of student-centered environments. If we succeed, however, such spaces often become built-in advertising platforms. By activating these common areas and increasing their transparency and porosity, we turn these high-visibility spaces into living billboards. Despite this fluidity, however, these spaces oftentimes serve dual purposes, and their design must balance flexibility against the constraints of disparate functions. Recent renovations of the Conaway Center at Columbia College and the Flaxman Library at the School of the Art Institute (SAIC) provide dual case studies in how designers can reimagine existing and constrained spaces as vibrant, light-filled common areas that provide a high level of both functionality and flexibility. In the case of the library, the stacks remained a vital element and had to be considered in the design of the space. At the Conaway Center, the immovable element was a stage, used for live music, comedy, and other performances. While the projects are different, we approached them similarly. Both are renovations of existing buildings so their shell space, ceiling heights, and the placement of windows were pre-determined. We also saw the stacks and stage as part of the schools’ educational infrastructure and made them accessible while also opening up the space for a variety of new uses. For both, we kept costs down by prioritizing the materials that needed to be replaced and added new “skins” to the elements that remained. 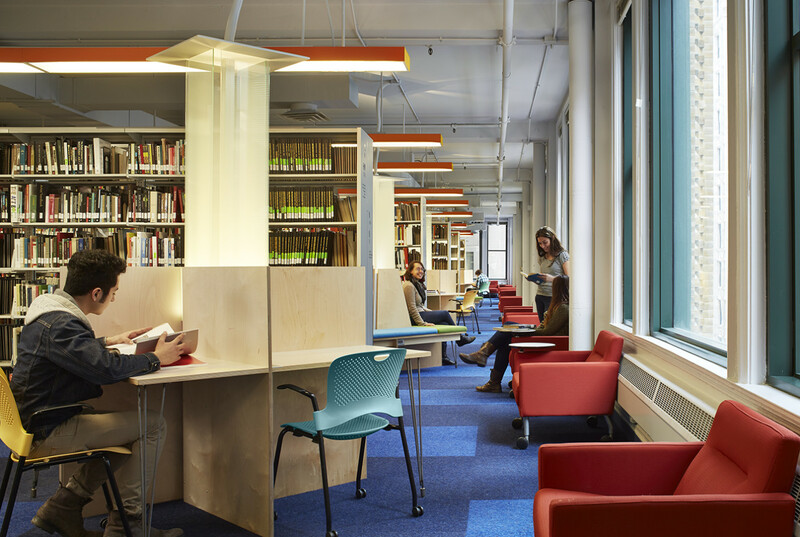 Seating is integrated with the rotated stacks at the Flaxman Library (SAIC). At the library, one decision had dramatic effects. The layout of the stacks had blocked the perimeter windows. Rotating the stacks 90 degrees changes the atmosphere of the room completely. The reorientation of the stacks also aligns with existing lighting, which is leveraged to illuminate walkways between the stacks. In addition, we added custom-built study carrels interspersed throughout the stacks to improve usability. Supplied with power and Wi-Fi, these environments are tailored to a variety of uses. Some face inward for independent, focused work, while others face out for casual reading or quiet chats. The library, while still serving its main function, becomes a bright, welcoming place for a plethora of activities. Custom built study carrels at the Flaxman Library (SAIC). At the Conaway Center, transparency becomes even more vital. Because the space looks out to the street, the school has an opportunity to engage passersby’s and increase its visibility. The center is primarily a gathering place but also regularly hosts large events. It features a stage along the north wall and a central mezzanine, both of which had to stay. To meet these programmatic needs, we created small groupings of movable tables and chairs in order to create intimate settings within the otherwise large, open space. Most importantly, we intentionally placed electrical power near the windows in order to draw students to the perimeter. In doing so, students activate the space and becomes a billboard for the school, reinforcing the mission of the school and treating the city as yet another classroom. Above, students gather along the north wall at the Conaway Center, engaging the passerby and acting as a billboard for the school. As urban schools grow and evolve, it’s important to identify design strategies that support and enhance the needs of the students and institution. For both the Conaway Center and SAIC, we learned that simple changes such as reorienting the stacks could produce dramatic effects and add short-term and long-term value. The renovated spaces represent a flexible functionality that becomes a selling point to future students. Good design can offer a competitive edge. With a little creativity, architects can transform these environments quickly and inexpensively and provide the institution added value in the process. It’s important to note that such projects are never really complete. They will continue to evolve as students evolve. It is best to understand these environments as works in progress, particularly when renovating an existing building, which requires ongoing restoration. By acknowledging this aspect of their nature, we also recognize the gradual—or sometimes rapid—evolution that characterizes urban higher education at every scale. A school’s relationship to a city changes over time; indeed, the city itself is continually in flux. This evolution will be born out in the built environment, in the school’s facilities and its campus footprint. Individual spaces are similarly dynamic; the projects mentioned above are not static but designed to adapt to changing needs. Even the students and the ideas they originate throughout their time in school can be seen as works in progress, deserving of spaces suited to their needs and supportive of their education.